Oh my, it’s been awhile since I last posted. It’s not that I haven’t been playing because I sure have! I just haven’t found anything new and exciting to post about, really. Other than this, which I had been dreaming of since Sunwell was current and I was a newb who’d never even raided before so had no chance in Azeroth of attaining it and its magical dream of not having to carry around ammo anymore. DEATH KNIGHT: There are now only two dps spec variations (no more 2H frost) and I have 3 DKs. Arelin – Male belf. Was already 100 and is unholy. Kalyon – Male human. Leveled from 90 (10 levels) and was 2H frost but will be dual wield for Legion. Kirgra- Female orc. Was already 100 and DW frost. She probably will mess around with blood just to get the artifact but I won’t actually tank anything. Driandis – Male belf, havoc. Feorn – Male nelf, havoc. Hunahuna – Female Tauren. Leveled from 96 (4 levels). Sparkly astral cow. Kaladis – Female Worgen. Leveled from 42 to 63 (21 levels). Sparkly astral wolf/kitty but still an alt. At least now she’s at boostable level. Vorta – Female Troll. BY bedtime tonight will have leveled from 89 (11 levels). Psychedelic troll kitty. Junahu – Female Tauren. Was already 100 and is BM but .. the artifact is a gun. She doesn’t do guns. She might try marks. Or she might just mog the thing. Towanda – Female Gnome. Leveled from 7 to 60 (53 levels). She’s fun and Titanstrike would be *perfect* for her. But .. too many levels. MAGE: Gotta cover every spec! Karius – Male human. Was already 100 and is frost. 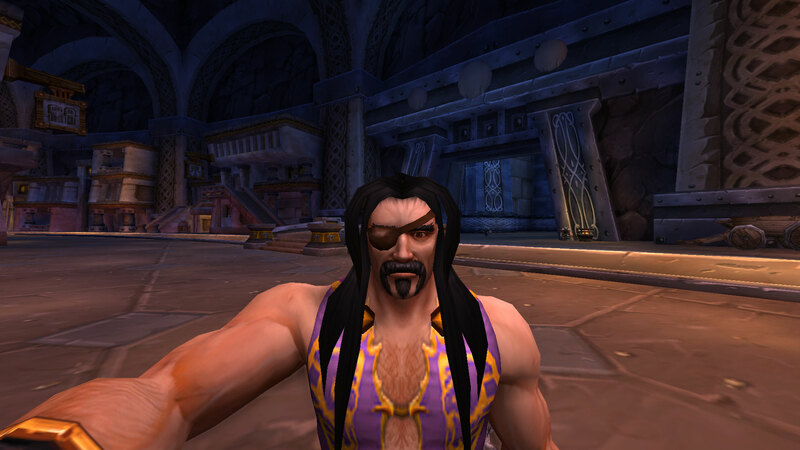 Oranis – Male belf. Leveled from 89 (11 levels) just so I could have a belf fire mage to wield Felo’melorn. Rozjin – Male troll. Leveled from 90 (10 levels) and is arcane. Adryen – Male undead. Was already 100 and is WW. Kimchii – Female Pandaren (Alliance). Leveled from 20 to 30 (10 levels) and is WW. Just … not into her and no reason to have another WW. Kerick – Male human. Leveled from 90 (10 levels) and is ret. I still don’t like the way he looks after the new models were put in, but … he has to get his Ashbringer. Van doesn’t feel the connection to it that Kerick does. Probably my main again. Vanethos – Male belf. Was already 100 and is also ret. Paddey – Male undead. Leveled from 90 (10 levels) and is shadow. Ragle – Male human. Leveled from 90 (10 levels) also as shadow, but will be switching to disc even though he probably won’t ever heal anything. Alestav – Male undead. Was already 100 and is subtlety. Kroy – Male human. Leveled from 59 (41 levels) and is totally in love with the new outlaw spec. So much so that I leveled him all the way because he needs his artifacts. Possibly a new main/co-main. Kriann – Female dwarf. Was already 100 and is elemental. Vozzkaz – Female troll. Leveled from 90 (10 levels) and is enhancement. Korgus – Male worgen. Leveled from 53 to 63 (10 levels) and is destro bank alt. Now he can make netherweave bags. Mission accomplished. Madorsa – Female undead. Was already 100 and is demonology. Doesn’t miss metamorphosis because she never used it. Maximum wild imps is her style. Can’t wait to get her creepy floating skull artifact. Oslee – Male undead. Leveled from 96 (4 levels) and is going back to arms. Sanbec – Male human. Was already 100, was pretty much the main in WoD (the only one to get the legendary ring), and is fury. If you have any alts left to get to 100 before Legion hits in two weeks, you’re in luck. Those demon invasions aren’t just for max levels! They give HUGE xp. Coming into the weekend I had two classes to get to 100 yet .. my druid was sitting at 96 almost 97, and my priest at 92 almost 93. It only takes about 3 invasions to get a level. And you don’t even have to participate if you don’t want to, you only need to be in the zone. My druid is now 100, and my priest dinged 98 this morning. Heck, I’m even thinking about getting the rest of my 90 and up alts done, there are two whole weeks yet. Assuming Blizzard doesn’t nerf the xp …. *offers up many sacrifices to the Metzen* Oh and while you’re at it, save the boxes until you do hit 100 … the gear will be ilevel 700 then. Also, if this is a preview of how the scaling zones will work in Legion, I love it. Seriously, the mobs and rewards all scale to YOUR level. So no matter what level you are (as long as it’s 10 or above) you CAN participate in the invasions! Sure you’ll die on the final boss … pretty much everyone does. But you can also just afk in a random corner of the zone and get credit. Awesomesauce.